Does not do a thing! The sales rep said this is the best. Well, it isn't. I used it for 2 months with no results. Lines still there, and I used it religiously. Maybe I expect too much. I turned to DIY products which are superior!! This was recommended to me by my older sister who is very skeptical of skincare and cosmetic claims. She vouched for this saying that she has noticed a difference in her skin since using this and that she even sees a (negative) change when she doesn't use this. I was looking for an anti-aging kind of serum that was safe to use in the morning and picked up a bottle of this. Compared to many othe...read morer similar types of products I researched prior to buying, this was not as expensive as most. I have now been using this for over two months and I really like it. It has a high concentration of vitamin c which is meant to help prevent wrinkles and loss of elasticity as well as fade sun spots and hyper pigmentation. I mainly started using this to prevent future damage but I have actually noticed that a fairly prominent spot on my cheek that I had for months was fading and now, it's gone. Rejoice! This tells me that this is actually doing something to reverse signs of aging. Prevention is key and I don't really expect anti aging products to reverse damage so the fact that did, speaks volumes. This is really easy and even enjoyable to use. The pump is great at dispensing only the amount you want. I use two pumps to cover my entire face. It has a slight warming effect that feels really nice. It is nothing too intense and doesn't tingle at all. My skin drinks this up so nothing is left behind and I can follow up with my regular moisturizer and makeup. I use this everyday in the morning only. My bottle is still going strong after two months of solid use. I have about two thirds of the product left. I am not giving a full ten stars because I am curious to see how a product that has other antioxidants in addition to vitamin c will work for me. 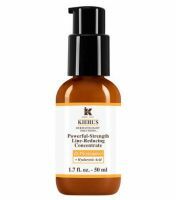 There are others on the market that contain vitamin a, c and e that I will look into after I finish my bottle of Kiehl's. That being said, I will continue to enjoy using my current bottle and if other products don't work at least as well, I will happily return to this. I hoped that this would be somewhere along the "lines" of (hahah, get it? LINES) something between a filler and serum but it has the results of neither. I tried it for several weeks and it did not make a negative or positive difference in any manner. The reason I rated it a 2 instead of a 1 is that I am aware that you sometimes must use a product for a month or more to see results. With so man...read morey superior products out there that work quickly at a fraction of the price, this will not be purchased again. Also, I like to keep my products in my purse when traveling or sleeping over somewhere, which may have affected it, but the consistency has broken up to a clear watery substance with white goops that are not blended together any longer. If this were all natural or something I would not be complaining about that, but it isn't and I am not impressed with anything about this.